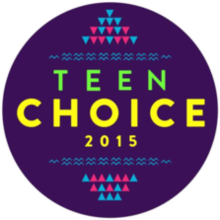 The 2015 Teen Choice Awards ceremony was held on August 16, 2015 at the Galen Center in Los Angeles. The awards celebrate the year's achievements in music, film, television, sports, fashion, comedy, video games, and the Internet, and were voted on by viewers living in the US, aged 13 and over through various social media sites. One Direction were the biggest winners of the night, winning eight of their ten nominations. Pretty Little Liars came in second by winning six of its ten nominations and Pitch Perfect 2 came in third, winning five of its ten nominations. Britney Spears was awarded with the "Candie's Choice Style Icon". 5 Seconds of Summer — "She's Kinda Hot"
Little Mix — "Black Magic"
Jussie Smollett and Bryshere Y. Gray from Empire cast. Rachel Platten — "Fight Song"
Flo Rida featuring Robin Thicke — "I Don't Like It, I Love It"
Fans had the power to choose the official theme song for the show from July 24 through August 14, 2015. Zedd feat. Selena Gomez's "I Want You to Know" was chosen as the year's theme song. The first wave of nominations were announced on June 9, 2015. The second wave was announced on July 8, 2015. The third wave was announced on July 30, 2015. Winners are listed first, in bold. ^ Walker's nomination is posthumously. ^ "Voting Rules". "Fox". Retrieved June 27, 2018. ^ "Teen Choice Awards:2105". CBC News. August 17, 2015. Retrieved August 19, 2015. ^ "Teen Choice Awards 2015: An Adult's Diary of the Teen Madness". Billboard. August 17, 2015. Retrieved August 19, 2015. ^ "Teen Choice Awards 2015 winners list: One Direction and Fifth Harmony scoop top prizes". Daily Mirror. August 17, 2015. Retrieved August 19, 2015. ^ "5 Seconds of Summer is Performing at #TeenChoice 2015!". teenchoice.com. Retrieved July 19, 2015. ^ "Little Mix to Hit the Stage at Teen Choice Awards". Retrieved July 25, 2015. ^ "Empire is coming to #TeenChoice!". teenchoice.com. Retrieved August 9, 2015. ^ "Rachel Platten, Flo Rida & Robin Thicke to Perform on Sunday Night's "Teen Choice Awards"". Retrieved August 14, 2015. ^ "Flo Rida & Robin Thicke, Rachel Platten Announced as "Teen Choice Awards" Performers". Retrieved August 14, 2015. ^ "HOSTS, WAVE 3 NOMINEES & MORE!". Retrieved August 8, 2015. ^ Coggan, Devan (June 9, 2015). "Teen Choice Award nominations pit Zayn Malik against One Direction". Entertainment Weekly. Time Inc. Retrieved June 11, 2015. ^ Johnson, Zach (July 8, 2015). "Teen Choice Awards 2015 Nominees: Wave 2 Revealed!". E! Online. Retrieved July 10, 2015. ^ Stutz, Colin (July 30, 2015). "Teen Choice Awards 2015: More Nominees; Ludacris, Gina Rodriguez & Josh Peck Hosting". Billboard. Retrieved July 30, 2015.